Noir—a name that strikes fear in the hearts of those who know the history behind the moniker. Long ago it was the code name of a very successful and feared assassin and now it is being used by two women who want answers to questions they have about their lives. The main character in this series is a highly skilled assassin named Mireille Bouquet who is based out of France. One day, she receives a mysterious email from a girl named Kirika. Following up on the message, Mireille goes to meet this girl and discovers that not only does the girl have no idea who she really is, but she also has no idea why she is so skilled at killing people and why she feels no remorse when she does. Realizing that their lives are linked somehow, Mireille and Kirika team up and begin traveling the world together as they seek out the answers to their shared histories, while avoiding the grip of an organization known as Les Soldats. Will the two find the answers they are looking for? And will that truth free them, or ruin them? 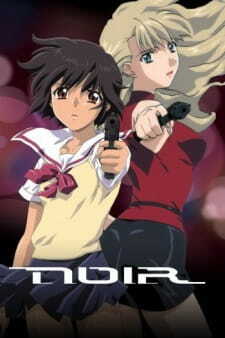 Noir was the first original anime by director Kouichi Mashimo and studio Bee Train which focused on the Girls with Guns sub-genre. It was later followed by two spiritual successors: Madlax in 2004 and El Cazador de la Bruja in 2007. Together, they are considered to be a Girls with Guns trilogy, even though the three TV series are unrelated story-wise. There are a handful of things that truly stand out from their peers. Sometimes, just occasionally, a series manages to do everything perfectly, pull together all the strands that things before and since have tried and failed to do. Fullmetal Alchemist is one example from the fantasy field; Ghost in the Shell another among postcyberpunk sci-fi; Azumanga Daioh an example from slice-of-life comedy. And, among the fairly niche girls-with-guns proto-genre, Noir is another. Noir isn't remarkable in its premise, in fact it's quite a patchwork of worn ideas; an amnesiac who is unsure whether her amazing combat abilities or complete lack of remorse is more peculiar teams up with a wronged and vengeful assassin to search for the truth about both of their pasts, and they find more than either of them bargained for. Take one part Luc Besson, mix in equal parts HKBO and spy thriller and a pinch of memory loss, and add anime. As the song says, though, &quot;it ain't what'cha do, it's the way that'cha do it&quot;; none of these various concepts are inherently bad, they each have the potential to be interesting, and Noir fulfils it all. The structure of this 26-episode series works as a perfect blend of the overarching plot and episodic formats, in that almost every episode our heroines have someone new to kill, somewhere new to do it and something new to factor into how they do it and how they relate to one another, but each episode a little more is revealed to them about the power behind the shadows - the pacing is slow, but perfect. Not a single episode is filler or side story, the plot is all. It also keeps you guessing, maintaining the atmosphere of mystery superbly; every new piece of the puzzle being put in place changes the picture a little, goalposts shift and new questions need answering. Noir's story is complex, meaty, demanding of attention and, in the final analysis, highly satisfying; this is by far and away the best assassin flick or secret society yarn I have ever seen, and I don't just mean anime. The cast is small, and dialogue is fairly spare. Kirika Yuumura, Japanese schoolgirl and amnesiac, is a very reserved, very introverted girl, seemingly all but unable to engage with people. Her initial inability to fully come to terms with her own ruthless, cold-hearted lethality is a feature that her business partner, experienced Corsican assassin Mireille Bouquet, does not share. She is a much more outgoing person, yet in some ways much more vulnerable; their relationship is tense, fragile and fascinating. Terrific acting from Kotono Mitsuishi and Houko Kuwashima does a fantastic job of giving the interactions between these two a highly credible, extremely watchable air. Even this excellent dynamic cannot hope to last 26 episodes, though - so, just when you think it's going to get stale, up pops the knife-hurling, child-voiced Chloe. A completely enigmatic character straight from left field, she shakes up these relationships just right and keeps everything nicely off balance. Aya Hisakawa's ingenuous voicing, her straightforward attitude and her innocence bring her a marvellously odd aura, and scenes between these three very distinct characters are tense and electric. All dialogue seems natural, though scripting is, as mentioned, sparse, but every word resonates, and often what is not said is as clear and significant as what is. The show adopts a very stylised-realistic look, with marvellous European locations and stylings, keeping things interesting, but art style and actual depiction imbuing the world of Noir with an empty, distant air to almost everything that fits the tone of the show perfectly. Character design is a similarly muted but stylised affair; no super assassin ninja suits or rainbow hair here, most characters, protagonists or enemies, simply look like everyday people (Chloe is once again an exception, with her maroon hair and billowing cloak - but that merely makes everyone else more ordinary). Mechanical detail like guns and computers are very detailed and accurate to reality, although some things such as cars are, while adequate, not quite up to the rest of the series' standards. It all contributes to a sense that this is something that really could be going on somewhere out there right now, a sense that I have never felt as strongly with any other anime. In a way, this seems a perfect candidate for live-action adaptation; but the fact that it is animation, in full control of the look of its world, is one of Noir's most subtle and brilliant tricks. Visually, perhaps at odds with its name, Noir is colour-drenched, from the opening credits to the gorgeous watercolour backdrops, but beautiful and bright though the world might be, it only goes to reinforce the darkness and evil that can dwell inside people. Its characters look like everyday people, but they are stylised enough that the amazing feats of agility and skill they accomplish seem like achievable ends, fully in keeping with the world around them. The sense of a visually familiar world is so well evoked that once the backstory begins to become clear, it slots right into the gap between constructed and actual reality with consummate neatness. Action choreography is another thing that contributes to Noir's sense of credibility. Most episodes of Noir climax with a gunfight; such a sense for creating gunfights that, working within the stylised reality the visuals provide, are believable, yet remain inventive and exciting, I have never seen with such consistency. Not all are as good as each other, but action in noir is entertaining at worst, and at best among the best fight scenes I have ever seen. The lightning-lit, rain-soaked battle across the rooftops of Paris in episode 20 is nothing short of brilliant. One factor that makes them so enjoyable is held in common with numerous other aspects of the series; they are designed in such a way that what you don't see is as important as what you do. Like blood. While at first glance, the lack of any actual visible blood almost seems counter-intuitive, it ends up seeming a lot more real than the red-steeped approach the subject matter more usually elicits; a truly skilled hitwoman kills cleanly, surgically, without mess. The deaths of opponents, crumpling like automatons, also quietly reinforce the idea of an organisation whose influence is great enough to render people nothing more than its puppets, to be used and discarded. Noir is not among the best-known anime, but by far the best-known aspect of the series is its soundtrack. While she had composed a couple of anime soundtracks previously, Noir's musical score is essentially the thing that catapulted Yuki Kajiura into the eye of anime OST fans, and on lists of the best anime soundtracks ever, Noir is rarely out of the top ten. By blending electronica, operatic grandeur and solemn church music, Kajiura created a unique sound that for me she has so far never bettered. The haunting massed choir chants, soaring, prayer-like Latin vocals and intricate, piercing violin and expressive piano solos are some of the most evocative, atmospheric music anime has ever known, truly a masterpiece. The opening theme, by Ali Project, is also excellent. Anyone interested in the musical side of anime should acquire and watch this series. Indeed, atmosphere is something that Noir does phenomenally well. The engrossing story, the excellent visuals and the superlative music all conspire to connect the viewer much more deeply to Noir than mere dialogue could. You get a powerful sense of the lonely, isolated, doom-laden feelings that the characters experience; it's splendid minimalist storytelling of the highest calibre. Obviously, Noir isn't for everyone. The slow pace and frequent flashbacks will frustrate some. The unremittingly serious and generally bleak tone will fail to appeal to some. The lack of any comedy or more than very occasional and mild fanservice will repel some. The spareness and minimalism will alienate some. The realistic setting will fail to interest some. The lack of explicitness and reliance on implication will confuse some. My experience also suggests that this series does not suit marathon viewing well, being more fitted to watching each episode individually. None of this, however, stops Noir from being a truly excellent series in all respects, worthy of the highest praise. Among its peers, Noir remains a series that exemplifies what outstandingly high quality even a story that, at root, revolves mostly around women shooting people can attain. Noir is another girls-with-guns anime with somewhat of an interesting plot about an ancient fate, however this is overshadowed by the slow development of the show and also the dull and lifeless action sequences. Mireille Bouquet is a top class assassin and Kirika Yumura is a mysterious Japanese schoolgirl who woke up with no memory at all. This is an action anime about two female assassins, who happened to encounter each other by fate. After the exciting action packed first episode, not much is explained about this show. Throughout the first half, all there is to go by are the subtle hints and surreal intro however there&rsquo;s only one word that can describe this show as it begins, &ldquo;boring&rdquo;. It was so boring that people hoping for some form of development, may not be able to continue watching this anime however for those who are patient can enjoy the better half of the show. It is the second half that is somewhat interesting, with a lot of things finally being revealed, like the secret organization behind everything. Though it is interesting it never becomes truly captivating. The animation style resembles that of &ldquo;Cowboy Bebop&rdquo; with the same artistry and fluid animation. This tries to give a little extra by being widescreen format and beautifully drawn characters, nonetheless it losses its greatness once the action kicks in. It isn&rsquo;t long before you&rsquo;ll quickly notice the incredibly useless enemies they are up against and the lack of blood. This isn&rsquo;t an important thing for anime, when it comes to a &ldquo;Bang! Bang! Shoot-em-up&rdquo; gunshot wounds are essential and that isn&rsquo;t found here. The music is exceptionally great especially when it gets to the action or when it&rsquo;s building up to it. On the other hand the music lacks variety so it gets tiring to hear the same tunes other and other but what really is annoying is the high pitch watch melody that will pierce through your ear drums whenever you listen to it. This had the potential of being a great anime, but it took so long for anything about the plot to be revealed that only the second half of the show was enjoyable to watch. This is the major downfall of this, plus other little annoyances like time wasting techniques and the constant, pointless flashbacks. This anime was predominantly filled with gun-battles which were usually great but it didn&rsquo;t change the fact that the enemies they faced were so rubbish, with a gun, that they couldn&rsquo;t even hit a parked car. It&rsquo;s only till the finally 2 episodes when something spectacular happens, but by then this decent show is over, with a BANG! If you enjoy the odd action packed anime and don&rsquo;t mind censorship, then by all means check this out. I initially approached this anime tentatively, having heard mixed opinions on it. Well, I'm glad I gave it a chance. Noir starts out pretty slowly, but episode by episode the plot picks up pace. The story revolves around two young women assassins, one with amnesia and the other with a troubled past, who together are journeying to find out more about their childhoods. Though I feel like it's a mixture of many plots I have seen before, somehow Noir seems to roll them all up and make it interesting all over again. Once the plot picked up pace it kept me engrossed, and I was on the edge of my seat until the end. I found myself very attached to the main characters. Initially Kirika struck me as very bland, as she rarely talked at the beginning, but I think that made it all the more enjoyable to watch as she slowly emerged from her shell, and developed a personality as the series progressed. I liked Mirielle as well, for she put up a front of being a no-nonsense and callous assassin who didn't need anyone in her life, but before she knew it was happening found that she had formed an emotional bond with Kirika, whether she wanted to or not. The interaction between the two of them is very interesting, for they balance each other out. Mirielle is outgoing and professional, while Kirika is quiet and very observant. Somehow the two of them really fit together. To me the art appeared to be alternately gorgeous and a bit off. Some episodes are better animated than others. However, on the whole I thought it was beautiful, and I was able to overlook the bad bits. As a whole, I thought that the actions scenes were excellent. The art really reflects the mood of the series, and I think the style suits it perfectly. The music is really what I felt pulled the series together. It's really gorgeous, and it really creates the mood of the scene. The only thing I ever had a problem with was that the melody from the watch eventually got tiresome after it was repeated many times. On the whole, though, I was blown away by the beauty of the sound. One of the only things I have to complain about is that I felt that some characters were a little bit lacking. Chloe, for example, felt really out of place in the series. She was the only person that seemed to really stick out in a bad way. I know she was supposed to stand out, but somehow...the character design just looks wrong. Her clothing looked silly as compared to the more realistic or european style of the others. However, personality-wise she is very interesting. Also, the lack of skilled male adversaries was odd, but I don't think it really stood out enough to irk me. Another thing that annoyed me was that in the beginning was the constant flashbacks. Seriously, I thought I'd kill myself if I had to see that scene with Mirielle as a kid one more time. Some of the plot was a bit unclear at times, but it was very good as a whole. I'd recommend this series to anyone who likes a mysterious plot with lots of action, and alternately a slower paced, more casual atmosphere, as well as a great soundtrack. An excellent, stylish anime but strangley lacking in blood considering the subject matter. PLOT: Noir has a very well worked out plotline. The 1st half of the series is quite slow, episodic and ‘assassination of the week’ orientated, but this is necessary in order to properly flesh out the personalities of Mireille & Kirika and develop their relationship to a point were the viewer actually cares about these two assassins. The second half of the series is much quicker paced as Mireille & Kirika delve further into their connected pasts and become entangled with the shadowy organisation Les Soldats. Light viewing Noir is not, as the truth that the two girls seek to find is determined to remain hidden – the viewer is required to think as much as Mireille & Kirika, as we are not given much more information than they are at any one time. The character development is superb and all the named characters introduced are all needed to progress the plot. Noir is an impressive piece of storytelling – not what I was expecting from BEE TRAIN at all. ANIMATION: Really nice very stylish animation, gorgeous realistic backgrounds accurately depict the various locales that the characters travel to to carry out their missions. The gunfight action is extremely well choreographed and exciting to watch and there is excellent use of lighting effects, unusual camera angles and cuts. Character designs are quite nice, but sometimes there is a lack of proper emotion in the faces in close up shots. The major criticism I have is the completely bloodless violence. You will be hard pressed to find more than a single drop of blood in this entire series! Mireille & Kirika do not hold back on their missions and the death toll is massive, but no one really seems to bleed – all wounds are very clean. It’s irritating as everything else is quite realistically done – a bit more blood would have heightened the drama. Also there’s a bit of James Bond style shooting going on – the girls can stroll through a crowd of machine-gun wielding SPs and never get hit and dispatch their enemies with a single shot from a handgun! But hey they’re the main characters its to be expected, and they look really cool when doing so! MUSIC & VOICE ACTING: The score deserved especial praise – an absolutely beautiful and very memorable soundtrack. I really like Kajiura Yuki’s work and Noir is no exception – grand sweeping melodies, great use of haunting choral pieces, classical scores and thrumming electro perfectly matches the action and intensifies the emotional drama, and all without drowning out the dialogue. The OP is by Ali Project and is quite similar to most of their other songs, but I quite liked it after listening to it a few times (despite the fact I utterly despise Ali Project! ), the ED is a nice calm ballad. Voice acting is excellent throughout – a small cast but all are great in their roles. Overall an extremely good series – highly recommended. Looses a point because of the slow start and the bloodless violence.